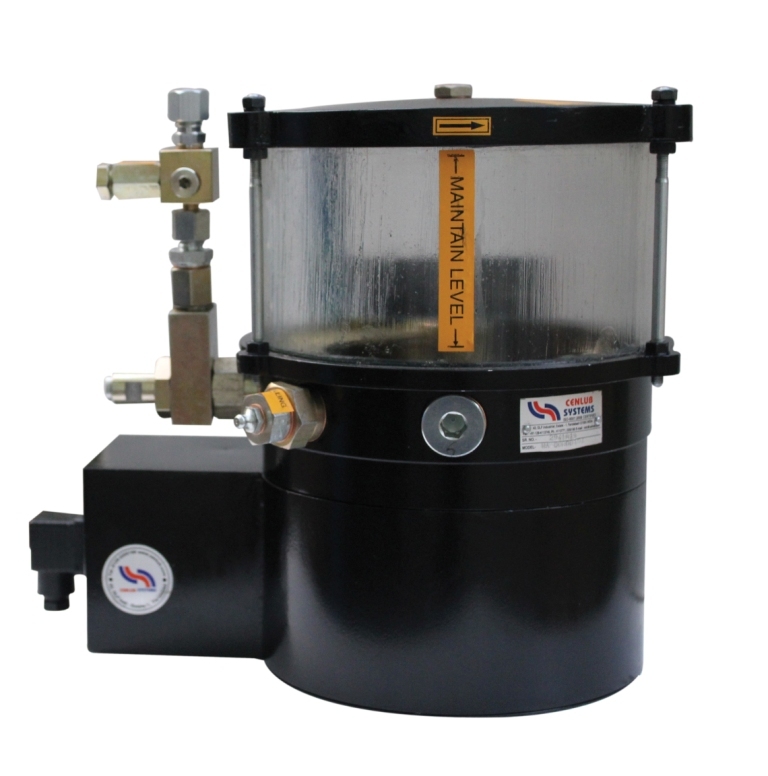 MGL Series 24 VDC Operated Grease Lubricator is an easy, reliable and cost affective way of greasing your machine parts. Coupled with Progressive Block/ Distributor for distribution, 24 V DC operated lubricator ensures that the lubrication is happening at each and every point. MGL Series lubricators has a number of industrial applications like Power Presses, Printing Presses, Plastic Pesses, Ginning Machines, Injection Molding Machines, etc. C02301S00598 MGL-24VDCT-02M-01-NS 350 Bar Yes 24 V DC 1 2 litres Aluminium No 4 cc per min. C02301S00599 MGL-24VDCT-02M-01-LS 350 Bar Yes 24 V DC 1 2 litres Aluminium Low Indication 4 cc per min. C02301S00604 MGL-24VDCT-03A-01-NS 350 Bar Yes 24 V DC 1 3 litres Acrylic No 4 cc per min. C02301S00605 MGL-24VDCT-03A-01-LS 350 Bar Yes 24 V DC 1 3 litres Acrylic Low Indication 4 cc per min. C02301S00606 MGL-24VDCT-03A-02-NS 350 Bar Yes 24 V DC 2 3 litres Acrylic No 4 cc per min. C02301S00607 MGL-24VDCT-03A-02-LS 350 Bar Yes 24 V DC 2 3 litres Acrylic Low Indication 4 cc per min. C02301S00608 MGL-24VDCT-03A-03-NS 350 Bar Yes 24 V DC 3 3 litres Acrylic No 4 cc per min. C02301S00609 MGL-24VDCT-03A-03-LS 350 Bar Yes 24 V DC 3 3 litres Acrylic Low Indication 4 cc per min. C02301S00610 MGL-24VDCT-05A-01-NS 350 Bar Yes 24 V DC 1 5 litres Acrylic No 4 cc per min. C02301S00611 MGL-24VDCT-05A-01-LS 350 Bar Yes 24 V DC 1 5 litres Acrylic Low Indication 4 cc per min. C02301S00612 MGL-24VDCT-05A-02-NS 350 Bar Yes 24 V DC 2 5 litres Acrylic No 4 cc per min. C02301S00613 MGL-24VDCT-05A-02-LS 350 Bar Yes 24 V DC 2 5 litres Acrylic Low Indication 4 cc per min. C02301S00614 MGL-24VDCT-05A-03-NS 350 Bar Yes 24 V DC 3 5 litres Acrylic No 4 cc per min. C02301S00615 MGL-24VDCT-05A-03-LS 350 Bar Yes 24 V DC 3 5 litres Acrylic Low Indication 4 cc per min.